thinks when doing this sketch. This card is pretty big to accommodate the layers and ‘corners’, 6×6″. The netting under the top layers is actually real fish net I picked up at a little shop on the boardwalk in Ocean City, NJ. Ocean City is the PG, family version of Atlantic city. And not a single ‘chain’ restaurant, store or hotel in the whole city. Fabulous place to visit, we had a great time. The beach is gorgeous thus inspiring this card! 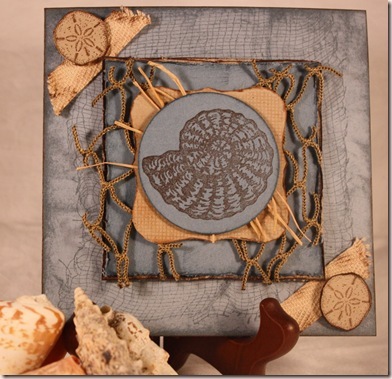 Anyhoo, the card layers are distressed with either creamy caramel, close to cocoa or buckaroo blue. I was surprised to see how similar bordering blue and buckaroo blue are. The ‘sticks’ under top circle are bits of raffia. Several layers are up on foam dots, especially the top circle. It is dotted on either side of the raffia. The label 1 die is dotted between the fish netting. It is actually in two pieces because the sketch showed two separate panels for that layer. Accessories: Heidi Swapp distresser, twill tape-UK, raffia and fish netting-UK, label 1 and circle Nestabilities, Cuttlebug, foam dots-Jody Morrow. All products SU! unless otherwise noted. Next postEasy Way To Sew On Buttons-Sneak Peak! Really like the use of layers on this card. Just beautiful! Lovely!! What a wonderful card! – and I love all that imagination! Sometimes I have a thought when I sit down to make a card and sometimes (mostly)……not so much..lol!